Gross Domestic Income (GDI) is a complete measure of all income earned in the United States. About half of all income is labor compensation, in the form of wages, salaries, and benefits. Benefits account for a growing share of labor compensation. A quarter of income goes to business-level taxes and the replacement of worn out machinery. A quarter of income is returned to owners of capital, including business owners and private homeowners. The shares of income returned to workers and to owners of capital remain constant over time once benefits, taxes, and depreciation are properly accounted for. Two-thirds of net income goes to labor and one-third goes to capital. This report will examine the full length and breadth of the data series. It will go through each component, in turn, and describe how its share of national income has changed over time. In other words, it is a comprehensive survey of 84 years’ worth of American income. Chart 1 represents all income made in the United States since 1929. 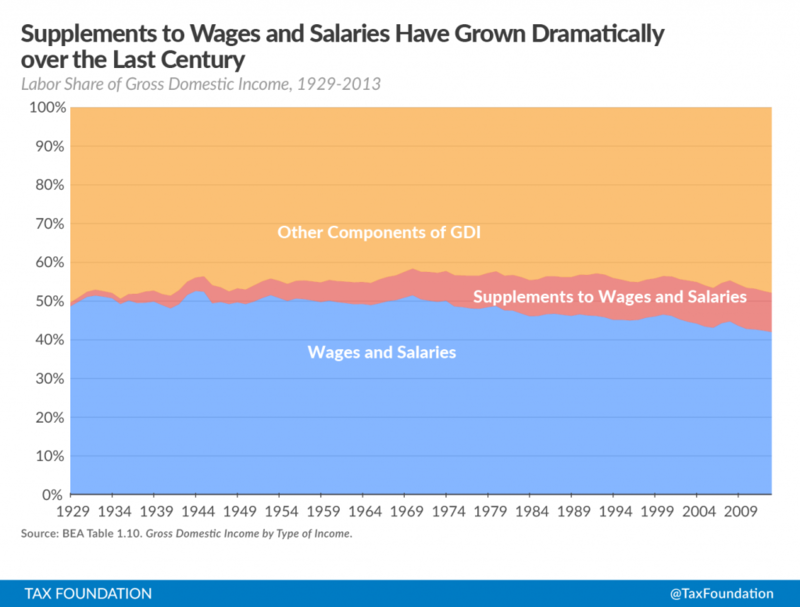 Rather than showing the overall rise in wages and salaries (from a mere $51 billion in 1929 to $7.1 trillion in 2013), the chart shows wages and salaries as a share of the total. This finding is similar in scale to an examination of personal income as reported on tax returns. Wages and salaries are also the largest form of taxable income, at $6.3 trillion out of a total $9.2 trillion in 2012. Chart 2 (above) includes the compensation paid that doesn’t take the form of wages or salaries. Included in this are pension contributions (including Social Security) and insurance premiums (such as health insurance) paid by employers. These are legitimate costs from the firm’s side, and they are legitimate earnings by workers representing their productivity. However, they aren’t flexible income like wages and salaries are. This sort of compensation has grown dramatically over the last century. 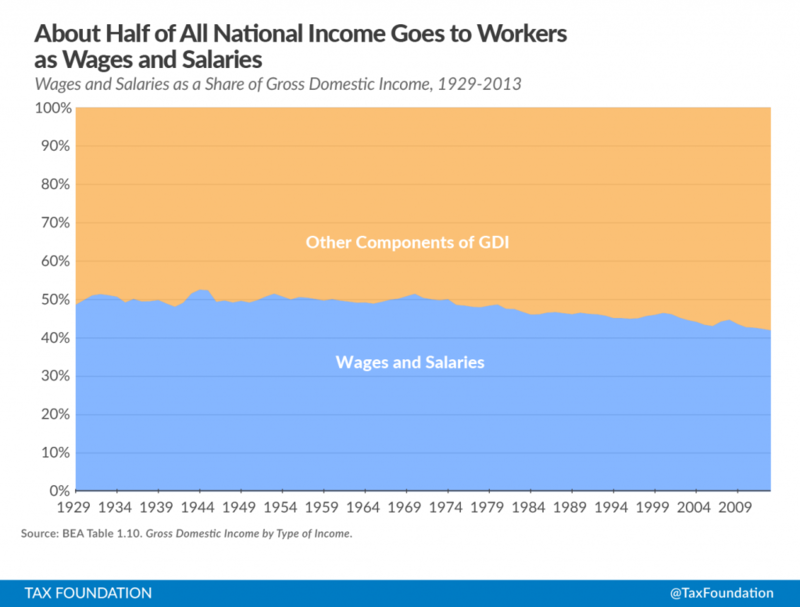 Once a negligible portion of national income, it now exceeds 10 percent. There are several reasons this component has increased so much over the years. The most important of these is the growth of the health care sector. The quality of health care has improved at an incredible pace over the last century, but the cost of employing talented workers in that field has resulted in high insurance premiums. In the U.S., insurance premiums are often paid by employers on the behalf of workers, so these have become a larger and larger portion of compensation packages. This is a political choice. It is the result of a tax policy that excludes these insurance premiums from taxable income. The exclusion of these insurance premiums from taxable income encourages firms to offer compensation packages weighted toward benefits rather than wages and salaries. Another factor driving the growth of supplements to wages and salaries is the increase in payroll taxes to fund Social Security and Medicare. As the U.S. population has aged, the costs of these programs have grown, and the payroll tax rate has risen. Both of these phenomena that lower the wage and salary share of GDI are results of federal policy. While employer compensation earned by individuals has remained relatively constant as a share of national income, an increasing portion of workers’ earnings are diverted, through federal policy, toward benefits rather than wages and salaries. For the purposes of future charts, we will combine wages and salaries with benefits to create a single category for labor compensation. Some national income never actually accrues to individuals, or even government. Some income is lost as our possessions wear down. Machines break, buildings get dilapidated, software becomes obsolete. These things require repair or replacement, which costs money. Depreciation is a sort of “anti-income,” an expense that effectively cancels out some of the revenues that the U.S. earns and represents the income that individuals, firms, and governments set aside to replace worn-down capital. Economists usually start with “gross” measures of income because they’re comprehensive. Gross income includes the portion that goes toward depreciation. But other measures, called “net income,” subtract that portion, on the grounds that it doesn’t ultimately accrue to anyone. It is simply lost. For understanding where all money in the U.S. goes, in the aggregate, it is useful to know the depreciation share of income. However, for the purposes of understanding inequality among individuals, net income – where one subtracts the depreciation share and only looks at the remainder – is the more appropriate measure because no one is able to consume the depreciation portion. A large portion of national income goes directly to the government, without ever reaching any individual’s pocketbook. This is accounted for by the BEA, under two main categories. The first, called “taxes on production and imports,” comprises most state and local taxes that businesses pay, as well as federal excise taxes. The second, called “taxes on corporate income,” is more straightforward: it is the sum of all corporate income taxes paid. These categories do not, however, include personal income taxes. They only include those taxes that come out of business profits. 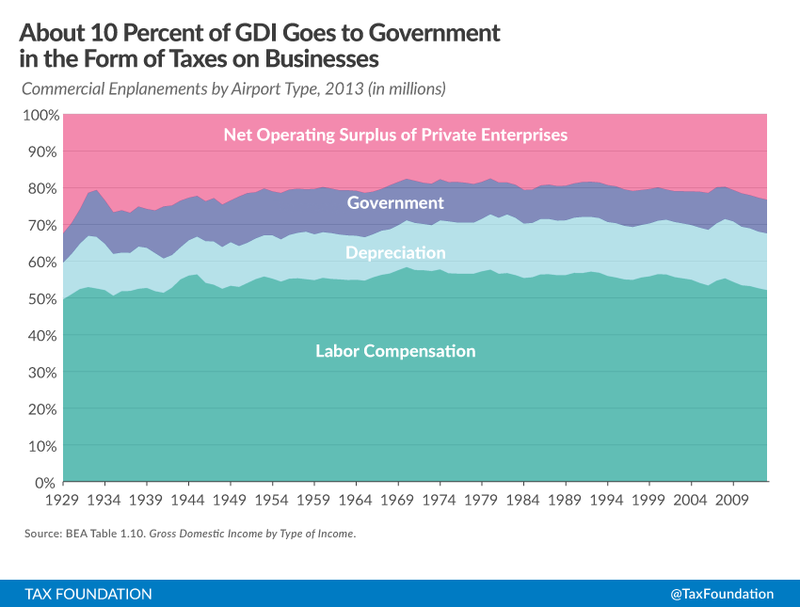 Chart 4 (above) includes business taxes, grouped together in a government share. Chart 4 separates the effects of both depreciation and government, leaving only the income that private enterprise actually distributes to individuals. 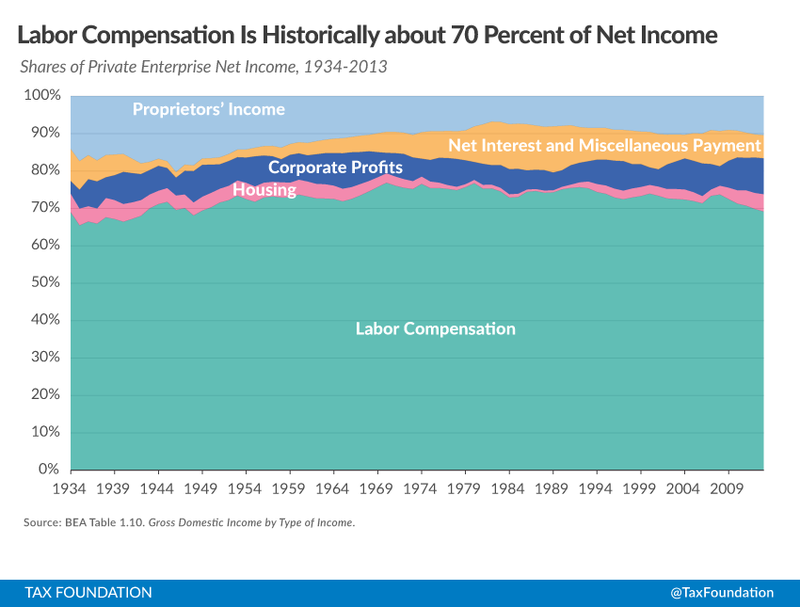 Most of this income is labor compensation (at the bottom of the chart), but a minority of it is other kinds of income, grouped together as the net operating surplus of private enterprises (represented at the top). Readers may wonder why the individual income tax, levied on wages, salaries, and investment income, is not a component of this analysis. The problem with including that tax is that it taxes all different kinds of income in a consolidated, complex process. As a result, it is impossible to distribute the individual income tax appropriately across the kinds of income categorized here. Instead, this report aims to show the income people earn from enterprises before they pay tax on those different kinds of individual income. That amount is best approximated by the combination of labor compensation and net operating surplus in Chart 4 (above). After business-level taxes and depreciation, the remaining fruits of private enterprise are distributed to individuals (at least, until they pay individual-level taxes on that income.) There are four important categories of income besides labor compensation. The first of these is the net housing income to people: that is, the surplus value that housing provides to homeowners even after accounting for money lost to upkeep and interest. This housing category includes all homes, whether or not they are rented. In other words, it reflects some actual income earned by individual landlords, but it also measures the benefit of having a place to live as a kind of “income” as well. This was about 4 percent of GDI in 2013. The second category of income is corporate profits, which reflects the after-tax profits of corporations. These find their way to individuals through capital gains or dividend income, or through pension funds and retirement accounts. Corporate profits were about 7 percent of GDI in 2013. The third of these is net interest income. This represents money paid to bondholders by enterprises. This was approximately 4 percent of GDI in 2013. The last category is proprietors’ income. This is the net income of noncorporate businesses, such as partnerships and sole proprietorships. Noncorporate forms of business are becoming more and more popular, in part because of tax policy. 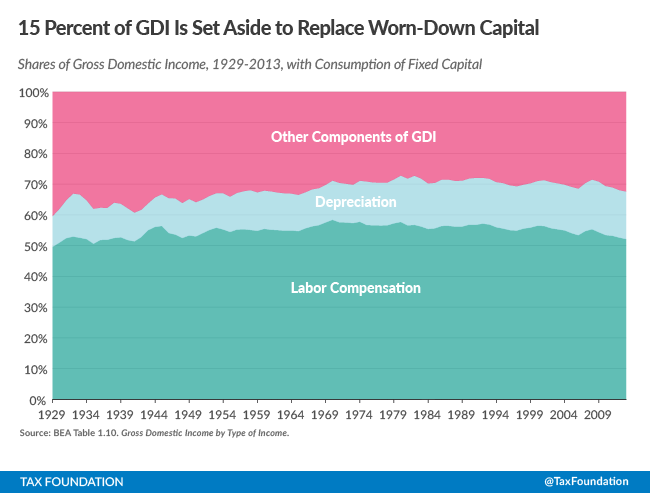 Chart 5 (above) is different from the first four figures in this report, in that it shows shares of income with depreciation and government excluded, rather than all of GDI. The labor compensation share is the same as in previous charts, while the remaining shares are the individual components of the net operating surplus of private enterprises in Chart 4. One question that economists have been concerned with recently is whether labor’s share of income has declined over time. From Chart 1, it is readily apparent why they would ask such a question. An examination of Chart 5 may prove useful for these purposes because it removes the extraneous portions of national income and looks specifically at the income actually earned by people. Benjamin Bridgeman of the BEA ran a calculation similar to the one underlying Chart 5 and concluded that once depreciation and production taxes are subtracted, “recent net labor share is within its historical range whereas gross share is at its lowest level.” In other words, the historic low in labor share was attributable to taxes and depreciation. The exact values of the labor and capital shares depend on the extent to which proprietors’ income counts as labor. However, despite some methodological differences, this examination of shares of GDI leads to the same conclusion as Bridgeman’s finding. Labor compensation has fallen somewhat as a share of net income since its peak in the 1970s, but it is within the historical range. Matthew Rognlie, using different methods, concludes that the increase in the capital share of net income comes entirely from the housing sector. While the housing sector is capital, it has some important characteristics that distinguish it from corporate capital, and it should not necessarily be categorized with the business sector. In “Silver Blaze,” Sherlock Holmes deduced, from the fact that a guard dog didn’t bark, that the dog was friendly with the intruder. The story is a good one in itself, but it is also an elegant illustration of the importance of negative results. One of the most striking features of this data series is the lack of any striking features. There is some variation in the data but far less than one might expect. In the years since Keynes made the observation, the phenomenon has largely held in the long run as well. The labor share of net income devoted to compensation was 67 percent when Keynes penned those remarks, and it is 69 percent now. This fact runs contrary to a number of well-worn narratives. The folk economic history of the 20th century is that labor and capital fought over important policy changes – like union membership – that had dramatic effects on their relative bargaining power. But here, from a broad high-level view, on a graph that comprehensively accounts for all income, it’s hard to even describe those changes as visible. None of it seems to matter – the Great Depression, the New Deal, World War II, the Baby Boom, the Reagan Revolution, the Dotcom Bubble – these things certainly affected total economic output, but they did virtually nothing to reallocate its division: about 70 percent of income goes to workers, regardless of public policy. This is potentially lessened only during periods of extensive unemployment. “Negative” results like this one – results that don’t show anything – are often just as important as positive ones. 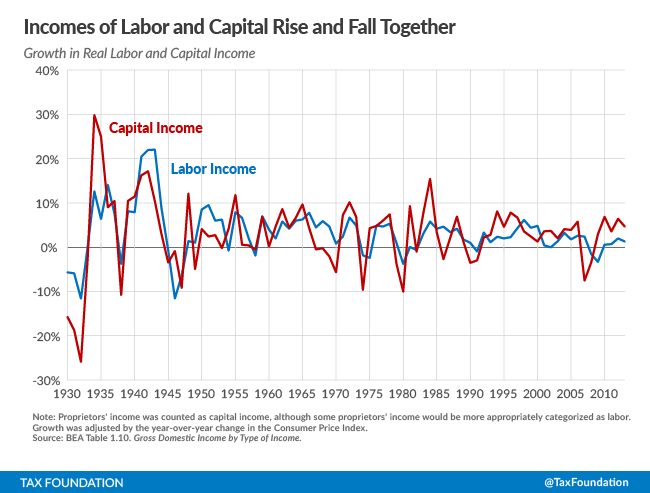 The stability of income shares to capital and labor is a significant non-result. It is important, for example, in determining the sources of inequality. It is strong evidence against a Marxian view of the world where the interests of labor and capital are opposed. Instead, the overall incomes of labor and capital are wedded to each other, for richer or for poorer. After the publication of Thomas Piketty’s Capital in the 21st Century, many readers emphasized the importance of capital income as a source of inequality, and some readers took his observation that “r > g” (meaning that the rate of return on capital is greater than the rate of growth for the economy as a whole) to imply that capital’s share of national income would increase continuously in the future. A study by the Economic Policy Institute attempting to explain the gap between overall growth in the economy and the growth in median wages found that inequality of compensation had much more explanatory power than shifts in labor’s share of income. This finding would become even stronger if the authors, like the other economists cited in this report, examined shares of net income rather than gross income. These findings suggest that the study of income inequality should remain focused on compensation. Overall, inequality among wages and salaries – the largest source of income – is a far more important contributor to overall income inequality than any kind of change in the labor share. To the extent that wages are falling as a portion of national income, it is due to the rise of other kinds of income that are mandated through or favored by the tax code – like contributions to entitlement programs, employer-provided health insurance, and returns to owner-occupied housing. Voters should consider whether these policies are worthwhile. They should also temper their expectations on the ability to raise taxes from capital income; it’s not nearly as large a pool of money as lawmakers promise it to be. Finally, all Americans should consider the collaborative nature of our economy, where labor and capital work together to create output, and their incomes rise and fall together. In light of that fact, the best avenue for improving welfare is to enact growth-oriented policies that increase the incomes of labor and capital alike. Alan Cole, Sources of Personal Income, Tax Foundation Fiscal Fact No. 449, Jan. 29 2015, https://taxfoundation.org/sources-personal-income. Tax Policy Center, Historical Payroll Tax Rates, Jan. 20 2015, http://www.taxpolicycenter.org/taxfacts/displayafact.cfm?Docid=45. Dean Baker, Center for Economic and Policy Research, Behind the Gap between Productivity and Wage Growth, Feb. 2007, http://www.cepr.net/documents/publications/0702_productivity.pdf. Benjamin Bridgeman, Bureau of Economic Analysis, Is Labor’s Loss Capital’s Gain? Oct. 2014, http://bea.gov/papers/pdf/laborshare1410.pdf. Scott Winship, Forbes, Workers Get The Same Slice of the Pie As They Always Have, Dec. 16 2014, http://www.forbes.com/sites/scottwinship/2014/12/16/workers-get-the-same-slice-of-the-pie-as-they-always-have/. Matthew Rognlie, Deciphering the fall and rise in the net capital share, Brookings Papers on Economic Activity Conference Draft, Mar. 2015, http://www.brookings.edu/~/media/projects/bpea/spring-2015/2015a_rognlie.pdf. This share also includes miscellaneous subsidies and loss or surplus of government enterprises. These categories are largely negligible in size compared to the scale of the U.S. economy. As such, they are quite literally a footnote in this report. Interest paid on mortgages is included in this total. Since enterprises can both receive interest and pay it, the BEA cancels these out to arrive at a net figure. 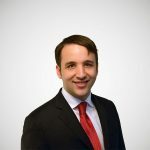 Kyle Pomerleau, An Overview of Pass-through Businesses in the United States, Tax Foundation Special Report No. 227, Jan. 21 2015, https://taxfoundation.org/overview-pass-through-businesses-united-states. It is also different in that it starts midway through the Great Depression, rather than in 1929. Corporate profits were negative for an extended period in the early 1930s, and the style of graph used here does not allow for negative income shares. Baker, supra note 3; Bridgeman, supra note 4; Winship, supra note 5; Rognlie, supra note 6. Bridgeman excluded production taxes and depreciation from net income, but not corporate income taxes. For some calculations, Bridgeman included proprietors’ income in the capital share, while acknowledging that some of that income was actually labor income. John Maynard Keynes, The Economic Journal, Vol. 49, No. 193, Mar. 1939, http://www.jstor.org/discover/10.2307/2225182?uid=3739584&uid=2&uid=4&uid=3739256&sid=21106714957033. The lowest numbers for the net labor share came in the depths of the Great Depression. In the post-war period, the lowest numbers belong to the Great Recession. Howard Gleckman, Forbes, Who Pays The Corporate Income Tax? Workers Bear The Burden, Too, Sep. 13, 2012, http://www.forbes.com/sites/beltway/2012/09/13/who-pays-the-corporate-income-tax-workers-bear-the-burden-too/. Jim Nunns, Tax Policy Center, How TPC Distributes the Corporate Income Tax, Sep. 13, 2012, http://www.taxpolicycenter.org/UploadedPDF/412651-Tax-Model-Corporate-Tax-Incidence.pdf. Justin Wolfers, The New York Times, Fellow Economists Express Skepticism About Thomas Piketty, Oct. 14, 2014, http://www.nytimes.com/2014/10/15/upshot/fellow-economists-express-skepticism-about-thomas-piketty.html. Thomas Piketty, About Capital in the Twenty-First Century, http://piketty.pse.ens.fr/files/Piketty2015AER.pdf. Lawrence Mishel, Economic Policy Institute, The Wedges Between Productivity and Median Wage Growth, Apr. 26 2012, http://www.epi.org/publication/ib330-productivity-vs-compensation/.